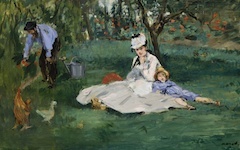 Manet, like many French artists before him including Watteau, thought of painting as a performance art. He portrayed an alter ego as an actor or stage-performer in a number of major compositions, of which The Tragic Actor is one of the best-known. It depicts a well-known star of the French theater, Philibert Rouvière, who also happened to be a part-time painter. Since the Shakepearean actor had exhibited a painting, Self-Portrait as Hamlet, in the Salon of 1864, Manet must have thought of Rouvière as an ideal alter ego, an actor/painter. Besides he was known for playing Hamlet, a role that has been called a poetic "self-portrait of the artist".1 For Manet, though, extraneous information was not enough. He needed to demonstrate the creative process within the painting itself even if the model's actual role in life was often an important factor in Manet's selection of models. The actor’s finger pointing downwards recalls Goya’s Portrait of the Duchess of Alba in which her finger aims at Goya’s name scrawled in sand at her feet. "Only Goya", it reads, as if to say from the real Duchess' point-of-view "Only Goya for me" but from her point-of-view as an alter ego, "I am Goya". In Manet’s portrait, though, his name is substituted by the suggestion of an M formed by the sword and the shadow of Rouvière’s legs. It is not an exact M but, in the poetic language of painting, there is enough to infer it. L: Manet, The Tragic Actor (1865-6) Oil on canvas. National Gallery of Art, Washington. The sword, as explained under Brush and Palette, has a long tradition in art as a symbol for a paintbrush. 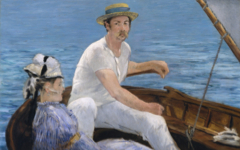 Here Manet imagines himself as an actor with his "paintbrush" at his feet. 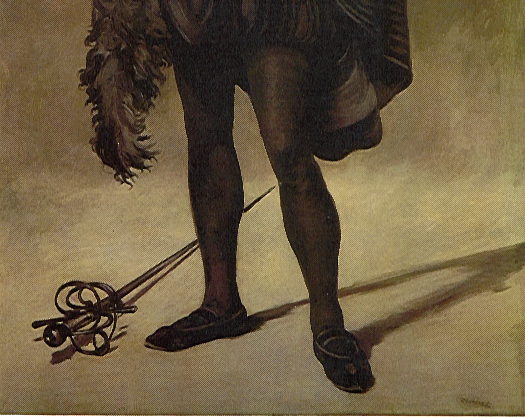 The actor stands, as even a contemporary noted, like a figure in a Velazquez portrait surrounded by empty space.2 Its resemblance to a Velazquez portrait is very important because on the floor the sword is facing in the "wrong" direction. It is pointing into the picture from our space as though it was Velazquez's brush, and not out of it. Indeed there are two entirely different light-sources on the floor. The shadow of the legs veers off to the right as though lit from low on the left. The sword, however, is lit from above because.... as "Velazquez's brush" it is lying on top of "the painting", lit by natural light, not painted light. There are two realities here: that of the “painting” in which the actor is portrayed, and that of Velazquez's studio in which the brush/sword lies on the surface of the painting. That not only explains the difference in the shadows but why Rouvière's shadow "in the painting" within the painting forms a V for Velazquez. Every element in the complex idea behind this painting has been logically constructed. In the process Manet transformed it into a seemingly simple composition of effortless construction and the result is magical. Nothing has been left out; nothing is superfluous. Manet imagines himself as Velazquez in the process of imagining himself as Hamlet painting his own portrait...and using Hamlet's own sword to do it. 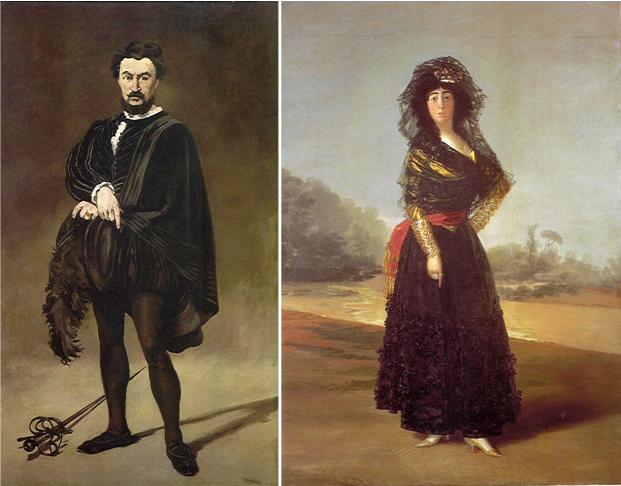 That's why Velazquez's V pointing into the painting becomes Manet's M pointing out of it. It's brilliant. 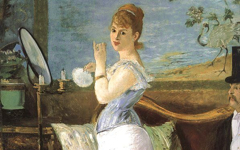 And, as in so many other paintings by Manet, we are looking into the mind of a great master where the studio and the painting have been fused. The analysis continues in Manet's Tragic Actor Part 2. Original Publication Date on EPPH: 21 Jan 2011. © Simon Abrahams. Articles on this site are the copyright of Simon Abrahams. To use copyrighted material in print or other media for purposes beyond 'fair use', you must obtain permission from the copyright owner. Websites may link to this page without permission (please do) but may not reproduce the material on their own site without crediting Simon Abrahams and EPPH.